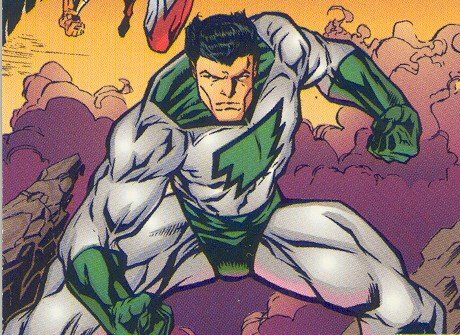 Powers/Abilities: As Captain Marvel, Billy Mar-Vell possesses a wide variety of superhuman powers. He has exhibited superhuman strength and resistance to injury as well as the ability to fly at fast speeds. (Whiz Marvels#1) - Captain Marvel made his first on-panel appearance. Billy Mar-Vell was really a young boy (a fact that would remain unknown to even his Judgment League: Avengers teammates in the future), but when he shouted the alien word "Kree!" he was super-scientifically transformed into the adult hero known as Captain Marvel. (Judgment League: Avengers (vol. I)#4) - After Angelhawk (Warren Hall), Canary (Dinah Barton), and Goliath (Oliver Queen) found and revived the body of the World War II hero known as Super-Soldier (Clark Kent), Captain Marvel joined forces with the quartet of heroes and formed the Judgment League: Avengers. Billy Mar-Vell elected to keep the fact that he was really a young boy a secret from his new teammates. (Secret Crisis of the Infinity Hour) - Along with the other members of the Judgment League: Avengers, Captain Marvel was transported to Apokolips by Doctor Strangefate (Charles Xavier) in order to fight the forces of Thanoseid during the Secret Crisis of the Infinity Hour. (Secret Crisis of the Infinity Hour#7) - Near the close of the Secret Crisis of the Infinity Hour, Captain Marvel was among those heroes present as American Girl (Carol Barnes), the former sidekick of Super-Soldier (Clark Kent), heroically sacrificed her life to further the heroes' cause. (Judgment League: Avengers (vol. II)#122) - "Trial of Mariner" - The metamutant member of the Judgment League: Avengers known as Aqua-Mariner (Arthur McKenzie) was framed for the destruction of three Roxxon oil freighters, a heinous criminal act which was actually perpetrated by the metamutant-hating madman known as Will Magnus. Given Aqua-Mariner's longtime personal war against surface dwellers who would harm his undersea habitat, the United States government automatically labeled him an "eco-terrorist" and sent in an army of troops to apprehend him without so much as an investigation. Captain Marvel and his fellow non-metamutant members of the JLA eventually captured Aqua-Mariner and imprisoned him without trial. Outraged by the manner in which their fellow metamutant was imprisoned without trial, most of the metamutant members of the JLA, under the guidance of the mysterious New Gotham power broker known only as Mr. X (Marco Xavier), freed Aqua-Mariner from JLA custody and set out to find the lost city of Atlantis, the legendary city of Homo Superior, under the surface of the Atlantic Ocean. But Captain Marvel and his fellow non-metamutant members of the Judgment League: Avengers were not about to give up Aqua-Mariner without a fight . . .
(JLX#1) - "A League of Their Own" - On the stormy waters of the North Atlantic Ocean, Captain Marvel and the Judgment League: Avengers engaged their former teammates -- the band of renegade metamutants now known as the JLX -- in an attempt to capture the metamutant Aqua-Mariner, who was wanted for torching Roxxon oil tankers. Instructed by Super-Soldier to engage in a full assault on the JLX Wavecruiser, Captain Marvel flew toward the JLX member known as Apollo (Ray Summers). Captain Marvel told Apollo that he and his metamutant associates had gone too far this time, but Apollo only responded by hitting Captain Marvel with one of his optic solar blasts. But when Apollo became preoccupied with defending himself against the JLA member known as Dark Claw (Logan Wayne), Captain Marvel was able to damage the hull of the JLX Wavecruiser with his superhuman strength. 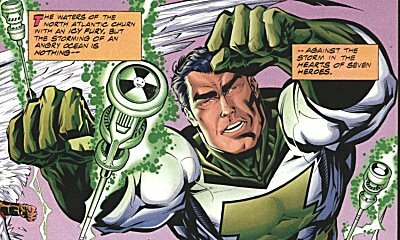 Captain Marvel's attack on the JLX Wavecruiser was cut short, however, when Angelhawk (the JLA member who was secretly a metamutant in league with Mr. X) feigned a broken back and fell into the ocean. All of the fighting between the two teams immediately stopped and Captain Marvel desperately dove in after his fallen comrade. Minutes later, Captain Marvel reemerged from the ocean depths with Angelhawk in his arms. Captain Marvel and his JLA teammates then retreated so that they could get Angelhawk medical attention, vowing to bring Aqua-Mariner to justice another day. (JLX Unleashed!#1) - "The Inextinguishable Flame" - Captain Marvel assisted fellow JLA members Super-Soldier and Wonder Woman (Ororo) in their futile battle against the immensely powerful Fin Fang Flame, a fiery demon unleashed upon an unsuspecting world by the Hellfire League of Injustice. When Wonder Woman suggested to Super-Soldier that they release the then incarcerated members of the JLX to help in the battle against Fin Fang Flame, Captain Marvel vehemently objected. Captain Marvel reminded his fellow heroes that Mr. X -- the JLX's leader -- was Skrull who was due to be extradited to the Kree homeworld for trial and that "those people" (metamutants) were not to be trusted. Super-Soldier disagreed with Captain Marvel's suggestion that all metamutants were evil by definition, but he admitted that he could not release the JLX because it was his duty to uphold the law. Suddenly, Fin Fang Flame attacked and engulfed Super-Soldier in a ball of flame. Captain Marvel stayed behind to help Super-Soldier as Wonder Woman went on her own to break Mr. X and the JLX out of prison. In JLX Unleashed!#1, Captain Marvel (Billy Mar-Vell) seems to have an irrational hatred of metamutants. This could be attributed to the fact that Captain Marvel's super powers are somehow tied to the Kree aliens who slaughtered the rest of Mr. X's Skrull civilization on Mars . . . perhaps the Kree still see Mr. X and his band of metamutants as a threat. Or perhaps Captain Marvel's negative opinion of metamutants stems from the fact that Billy Mar-Vell is only a child and still immature. debuted in MARVEL SUPER-HEROES (vol. I)#12) and DC's WHIZ COMICS (DC's Captain Marvel debuted in WHIZ COMICS#1). Special thanks to penciler Matthew Haley for identifying Captain Marvel (Billy Mar-Vell) as one of the characters present at the death of American Girl (Carol Barnes) in SECRET CRISIS OF THE INFINITY HOUR #7.